Central Bank mortgage deposit rules have had an impact on the market. THE YEAR 2017 was one of “two halves” according to two comprehensive reports into the residential property market. The last quarter of the year saw “almost no change in the average asking price”, a situation that was also reflected in the third quarter of 2017. In contrast, the first half of the year saw average prices rise nationwide by almost 9%. Ronan Lyons, assistant professor in Economics in Trinity College Dublin, and author of this morning’s Daft.ie report, said that the trend might seem peculiar but was in fact directly linked to the impact of Central Bank mortgage rules that came into effect this year. At the beginning of 2017, minimum deposit rules were relaxed from 20% to 10%. This, said Lyons, “spawned an almost immediate price response in the market” but that once this change to credit lines had been absorbed, the rules kicked in. With incomes rising only very modestly, the minimum deposit rules still act as a cooler in a market with limited supply. 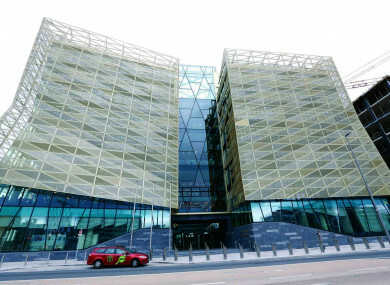 The MyHome.ie report for Q4 of 2017 echoed the sentiment that the Central Bank lending rules were pivotal to the slower pace of price rises towards the end of the year. It also cited seasonal trends for the contrast between the two halves of the year. There was still a small climb in prices in Dublin from July to December but this was cancelled out on a national basis by a slight decline outside urban areas. 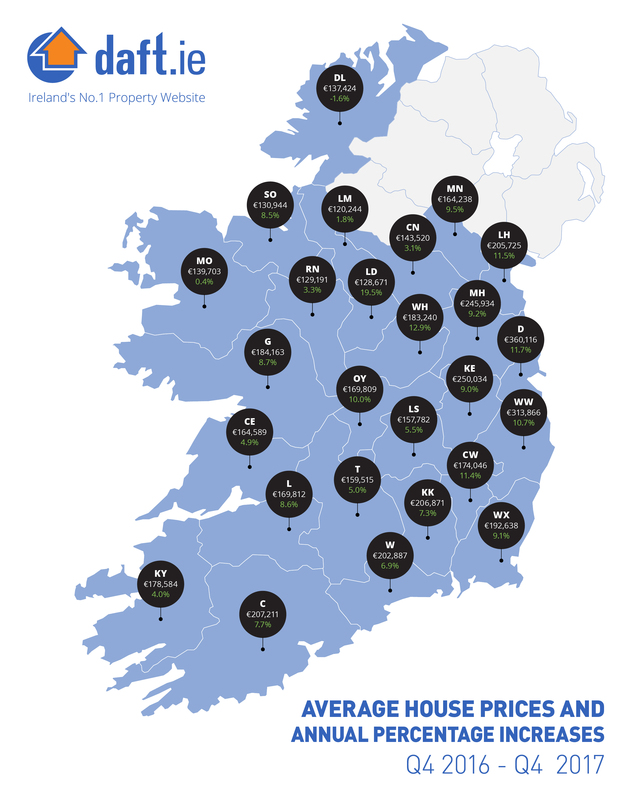 Overall, however, 2017 was a year of “robust” inflation in the residential market - MyHome had prices rising by 10.2% nationally and 11.1% in Dublin. Daft.ie saw an 11.7% hike in asking prices in Dublin between Q4 2016 and Q4 2017 – and 9.3% nationally. This meant that over a 12-month period to end of 2017, house prices rose on average more than they did during 2016 (8%) or 2015 (8.5%). The average asking price is up 47% overall from its lowest point in Q3 of 2013. 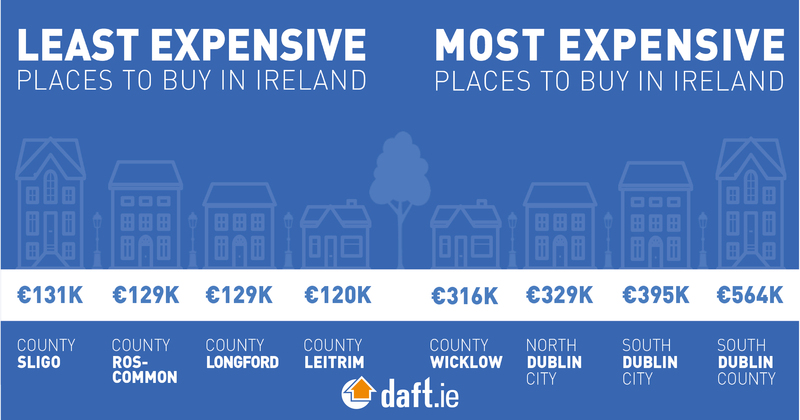 This represented a jump of over €20,000 on average per home in 2017, according to Daft.ie. So where does that leave buyers in 2018? Ronan Lyons cautions that some 20 areas across Ireland – particularly in Dublin, Limerick and Cork cities – are within a year or two of reaching the average asking prices they commanded at the 2007 peak of the Celtic Tiger. “However… it’s not only South County Dublin. Areas like Raheny, Stoneybatter, Lucan and Kimmage are as close to their peak as areas like Milltown, Clontarf or Castleknock. And it’s not just Dublin too. In North Limerick City, prices are less than 20% from their peak while in Cork City, Ballincollig prices are just 22% of peak,” he writes in today’s report. If we as a country get that wrong, we will be stuck in a sprawl model, with implications for family life and environmental sustainability, as well as for the housing market. If the Irish market was functioning properly we would be seeing around 90,000 transactions per year. By the end of 2017, MyHome.ie found that they had just 18,900 properties listed for sale – “a fresh record low, down 9.4% on the year – representing less than 1% of the housing stock”. Homes are therefore being snapped up quickly (over a third of properties listed for sale in Dublin are gone within two months) and at a premium. Chief Economist at Davy Stockbrokers, Conall MacCoille, and author of the MyHome report sounded a positive note for those in negative equity, the numbers of whom have reduced due to the rise in average property values. “With greater equity in their homes, more Irish households will seek to move home, helping housing market activity,” he predicted. Email “House prices are within a year of getting close to Celtic Tiger peaks in some urban areas”. Feedback on “House prices are within a year of getting close to Celtic Tiger peaks in some urban areas”.